This is an easy-to-read introductory book for foreigners to pursue their curiosity on Korea. 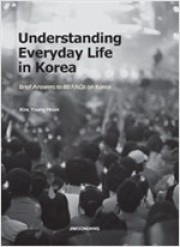 This book tries to explain Korean culture by answering 80 questions on various subjects, including the characteristics of Korean customs, rituals and traditional ceremonies, manners, interpersonal relations and behavior, language and values, religion and folklore, food culture, housing culture, entertainment, pop culture, etc. The author gives an anthropological and historical explanation to these questions collected from international college students as well as from the internet. “소개팅이 뭐예요? 한국에는 검은 차가 왜 이렇게 많아요? 뜨거운 물에서 왜 시원하다고 해요? 왜 결혼하면 국수 먹여 준다고 해요?” Understanding Everyday Life in Korea는 한국을 궁금해 하는 외국인의 질문 80가지에 대한 역사적, 인류학적 답변이다. 한마디로 이 책은 외국인들이 한국의 일상을 쉽게 이해하도록 도와주는 입문서이다. 한국의 관습, 종교행사와 전통의식, 예절, 인간관계와 상호 행동양식, 언어와 가치관, 종교와 민속, 음식문화, 주거문화, 오락, 대중문화 등 다양한 주제에 걸친 80개의 질문에 대해 설명하면서 한국 문화 전반을 이해하도록 돕는다. 이화여자대학교 국제대학원 한국학과 교수이자 이화여자대학교 한국문화연구원 원장인 저자는 외국 학생들의 질문과 인터넷에서 수집된 다양한 궁금증에 대해 역사적, 인류학적으로 풀이를 하였다. Why are there so many black cars in Korea? Why do Koreans like to go to a jjimjilbang just to lie on the floor? Jjimjilbang which is translated as “hot sauna” does not fail to astonish first-time visitors of Korea. In fact, jjimjilbang has become a mandatory course for foreigners who want to experience Korean culture. The fact that jjimjilbang is spreading to places like America as well as Malaysia is something Koreans are very proud of. 1. How do Koreans greet strangers for the first time? 2. Why is it rude to call older people by their names? 3. Why do Koreans ask personal questions to people they hardly know or meet for the first time? 5. What is jeong that Koreans often talk about? 6. Why is the meaning of “yes” and “no” unclear in Korea? 7. Why do Koreans share their glass with each other while drinking? 8. Why do Koreans call their spouses ‘our’ husband or ‘our’ wife? 10. Why do Korean female students hold hands or link arms with each other when walking together? 11. Why don’t Koreans knock on the door? 12. Why do Koreans prepare an enormous amount of food and tell their guests to eat more? 13. Why do Koreans seem quiet and reticent? 14. Why are Korean people so reluctant to wait in line? 15. Why do Korean women care so much about their appearance? 16. Why do Korean women wear strong and vivid colors? 17. Why do Korean women smoke in the toilet? 19. Why do Korean men like to be called oppa? 20. Don’t Korean men need to serve the military when the two Koreas unify? 21. What age does one become a grandfather or a grandmother? 22. Why do Koreans seem to prefer squatting over sitting even outside their homes? 23. Why do Koreans fight for the bill in restaurants? 24. Why do Koreans feel uncomfortable eating out alone? 25. Why do Koreans rarely apologize when they bump into each other on the street? 26. Why do high school seniors have dinner at their schools? 27. Why are Korean parents so obsessed with their child’s education? 28. Why do companies allow workers to come late on the day when the College Scholastic Ability Test is being held in high schools? 29. Koreans work without taking any breaks. Why do Koreans live such a hectic life? 30. Why do Koreans like using seals more than signatures in legal documents? 31. Why do people sitting in a bus or on the subway hold bags for those without seats? 32. Why do people yield their seats to elders on a bus or train? 33. Why are Korean bus drivers so aggressive? Why don’t they follow the traffic rules? 34. Why are there so many black cars in Korea? 35. Why do Koreans enjoy going to a noraebang after drinking? 36. Why do Korean films become so popular? 37. Why are Korean soap operas mostly about family issues? 38. Why do Koreans like to go to a jjimjilbang just to lie on the floor? 39. Why do Koreans mix rice? 40. Why do people say that Koreans cannot live without kimchi? 41. Why do Koreans say they feel “siwonhada” (cool) when eating hot pepper broths? 42. Why do Koreans use spoons and chopsticks made out of metal? 43. Why are udon and japchae served in Chinese restaurants? Why are pickled radish and onions served along with these dishes? 44. Why do Koreans use toilet paper on the dining table? 45. Why do Koreans cut beef with scissors? 46. Why do Koreans put cherry tomatoes in desserts like cakes and ice flakes? 47. Why do Koreans hide dog soup in restaurants but state that dog soups are healthy? 48. Why do Korean parents get so involved in choosing their children’s marital partners? 49. When Koreans get married they sell ham, but what exactly is it? 50. Why is a Korean wedding ceremony so short? 51. Why do Koreans change from a Western-style wedding dress into a traditional Korean dress during their wedding ceremonies? 52. Why do Korean brides and grooms wear Western clothes and take wedding pictures in a royal palace? 53. When Koreans marry they say they will serve the noodle for the guests, but in fact, it is hard to find noodles in the wedding. Why does this happen? 54. Why do Koreans put food, alcohol and even cigarettes on their ancestors’ tombs and why do they perform a big bow, called jeol, in front of the tomb? 55. What is special about Korean funeral culture? 57. Why is Hangeul highly praised around the world? 59. Why is the Chinese zodiac important to Koreans? 60. Why do Koreans prefer to marry a man who is four years older than a woman? 61. Why are Koreans reluctant to write their names in red? 62. Why is Korea’s city nightscape full of red crosses? 63. Why are Korean temples so colorful? 64. Why do Koreans like magpies and dislike crows? 65. Why are Koreans interested in other’s blood types? 66. Why is the 4th floor written as “F” in Korean buildings? 67. Why are there so many apartments in Korea? 68. Why does the oldest person usually pay for everyone at a restaurant? 69. What’s the meaning of Seollal? 70. What does Chuseok mean to Koreans? 71. Why do Koreans become one year old as soon as they are born? 72. Why do Koreans have seaweed soup on their birthday? 73. Why are most Korean names composed of three syllables? 74. Why doesn’t a Korean wife take the surname of her husband after marriage? 75. What is the origin of ‘Korea’ as a country name? 76. Is Korea an ethnically homogenous country? 77. What does Baekdusan Mountain mean to Koreans? 79. Why do Koreans hesitate to adopt children? Kim, Young Hoon is Professor of Department of Korean Studies at the Graduate School of International Studies and the Director of the Research Institute of Korean Culture at Ewha Womans University. He is a cultural anthropologist. He received his degrees from Yonsei University (B.A. ), Indiana University (M.A.) and University of Southern California (Ph.D.). He is the author of Culture and Image (2002), From Dolmen Tombs to Heaven’s Gate (2013) and has published articles in the areas of Korean cultural studies, visual studies, and Korean aesthetics.